When end customers or consumers purchase a garment they look for quality first. So, to have a satisfied customer, retailers must keep only quality product in their shops. According to the purchase agreement, buyer can penalize supplier for supplying them defective pieces. It might cost the factory lot of money and goodwill. So the manufacturers take care for garment quality at each stage of production. In maximum cases buyer inspects shipment at factory before accepting the finished garments. Whatever defects found in the final inspection, it is the cumulative figure of previous processes. So it is very important to rectify defective pieces at process where it occurred instead of in the finishing. How defects come in garments? Lot of people and machines are involved in producing a garment. There is an obvious chance of making few faulty garments in a batch due to faulty machine or human intervention. The defective pieces can be corrected by repairing or changing defective parts. But repair work costs money and time. These both increase inefficiency of the company. And if one defect passed through initial process without detecting and correction and process goes on then at the later stages repair cost will be much more than detecting it in initial stage. Production process starts after receiving of fabrics and end after dispatching of packed garments. Generally export house put quality check points at the end of each process to ensure that only quality pieces move to the next process. Department wise quality check points have been explained in the following. In the fabric store fabric is being checked before issuing it to cutting department. In general not all the fabric is checked. Usually 10% of fabrics are checked for good fabric suppliers. For power loom fabric and printed fabric 100% checking is done. Fabrics are checked in flat table, flat table with light box or on fabric checking machine. 4 point system for fabric inspection is used to measure the quality level of the incoming fabric. 6. Sewing Department: Checkpoints in the sewing departments are as following. Inline inspection: In assembly line generally check pints are kept for the critical operations. In these checkpoints, 100% checking is done for partially stitched garments and defect free pieces are forwarded to the next process. This type of checking is used for high value garment. Roaming inspection: In this case checkers roam around the line and randomly check pieces at each operation. Traffic light inspection system: Very few garment manufacturer use this inspection system. In this system each operator is given a card for measuring their quality performance. Quality checker goes to the operator and do random check for few pieces and according to the inspection result, checker marked red or green on the card following rating criteria. Audit of the checked pieces: Very few manufacturers follow this audit procedure but it is very essential checkpoint to assure that only 100% inspected garment are sent to finishing from sewing department. And all defective pieces are repaired before sending to finishing. Initial finishing inspection: checking done prior to pressing of the garment at finishing room is known as initial finishing. Final finishing Inspection: After pressing garments are again checked and passed for tagging and packing. 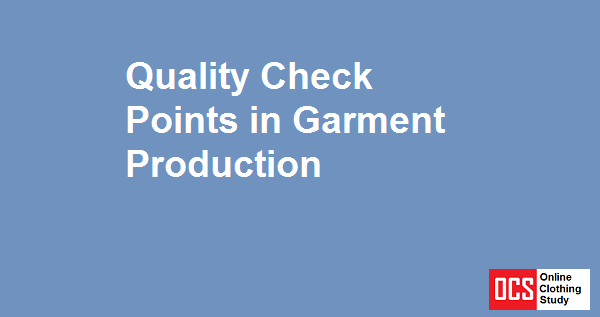 Quality control and quality checking points in garment industry.